TechspaceTechspace cofounders David Galsworthy and Alex Rabarts. 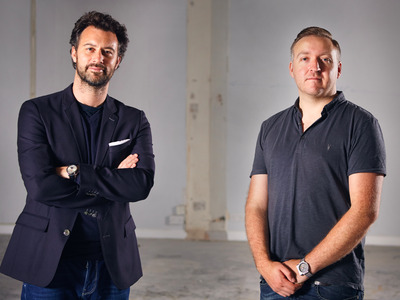 London startup space provider Techspace has raised £5 million to help it expand its coworking business to Berlin and build out its UK operation. The company — founded by entrepreneurs David Galsworthy (CEO) and Alex Rabarts (CTO) in 2012 — raised the money through a consortium led by real estate investor and entrepreneur Leo Noé. Techspace provides flexible coworking space designed for fast growing technology companies as well as larger, more established businesses like Virgin Media and Business Insider UK. It boasts over 1,000 members from more than 50 businesses. The company currently has five coworking locations across London but the Berlin location will be Techspace’s first overseas outpost when it opens towards the end of this year in the city’s Mitte district. Techspace said its Berlin site will boast approximately 20,000 square feet and enough room for up to 300 members. It added that prices will be in line with how Techspace positions itself in London, where memberships go from £315 per member per month up to £9,800 per month for an enterprise. In Berlin, Techspace will be competing with local startup space provider Factory Berlin as well as the likes of WeWork, which is arguably the largest coworking space provider worldwide. The latter opened up its first outpost in Berlin earlier this month. Berlin’s tech scene has taken off in the last few years and the city is now home to a number of well-known startups, including food delivery startup Delivery Hero, music startup SoundCloud, and startup builder Rocket Internet. Index Ventures investor Timm Schipporeit told Business Insider in Berlin earlier this month that he expects Berlin to overtake London as Europe’s biggest technology hub within the next few years. Coworking has already grown exponentially over the past few years. There’s been a huge, global shift towards flexible, collaborative workspaces, particularly in technology. We empower our community to focus solely on growth and innovation, leaving workspace considerations to us. This investment will enable us to continue supporting tech companies in their growth beyond being startups, develop our offerings in London and also expand to Berlin – a destination that makes perfect sense given the city’s established reputation as a hub for technology innovation. Full disclosure: Business Insider UK is a Techspace tenant.